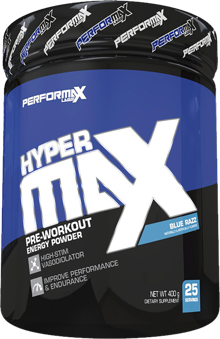 Oct 04, 2017 Performax HyperMax: MAX Strength Pre Workout! Yes! HyperMax has been upgraded and is now out! HyperMax XT has been renamed back to just HyperMax, and this is a serious energy/pump/mood/mindset formula to be reckoned with! Check our new HyperMax blog post to read about this new version, upgraded in October 2017 -- and it's now our #1 'aggressive' pre workout supplement without DMHA / DMAA! Hyper-Energy, Focus, Pumps & Performance! There's a powerful new pre-workout on the market - HyperMax from Performax Labs! HyperMax will dramatically enhance workout performance by hyper-targeting 5 key areas- Energy, Strength, Focus, Endurance and Vascularity. While HyperMax was created to provide intense energy levels and extreme focus, it will also promote huge pumps, increased strength, mass gains and in-the-gym endurance! HyperMax works within minutes – you'll begin to experience the kind of energy and intensity that will make you want to rage into the gym and attack the weights with extreme ferocity! • This powerful complex provides clean, extended energy – NO jitters and NO crash! • Dramatically enhances intensity, focus and drive! • Research dosing – 3 grams – to fully saturate the muscles with creatine! • Promotes endurance, strength and power! • Promotes new muscle growth! • Promotes an intense pump! • Blocks the buildup of lactic acid! • Allows you to push through those tough sets! • Utilizes multiple pathways to increase production of Nitric Oxide! • Experience intense pumps and more rapid nutrient delivery! • Utilizes an effective 1 gram dose per serving! • Enhances mood and focus! • Utilizes an effective 250mg dose! HyperMax has the formula that will give you the kind of intense results you're looking for– it's time to experience a Hyper workout – pick up a container today! Citric Acid, Maltodextrin, Natural & Aritificial Flavors, Sucralose, Acesulfame Potassium, Silicon Dioxide, Red #40. To use: Determine tolerance by consuming 1/2 scoop with 8oz. cold water 30 minutes pre workout. Once tolerance has been determined, you may consume 1 scoop with 8oz. cold water 30 minutes pre workout. Do not use more than 2 scoops in any 24-hour period. Discuss with your physician before taking if you have a medical condition or are taking any prescription medications. Stop use and discuss with your physician if any negative effects occur. Do not exceed suggested dose. Do not take if pregnant or lactating. This product contains caffeine. Do not combine with other stimulant-based products. Do not take 6 hours before bedtime. Must be 18 years old to use this product. Keep away from children. Store in a cool, dry place.